This plugin adds the ability to encode WCS 2.0.1 multidimensional output as a NetCDF file using the Unidata NetCDF Java library. Input coverages/slices should share the same bounding box (lon/lat coordinates are the same for the whole ND cube). NetCDF output will be produced only when input coverages come from a StructuredGridCoverage2D reader (this allows to query the GranuleSource to get the list of granules in order to setup dimensions slices for each sub-coverage). NetCDF-4 output is supported but requires native libraries (see Installing required NetCDF-4 Native libraries). NetCDF-4 adds support for compression. Use format=application/x-netcdf4 to request NetCDF-4 output. 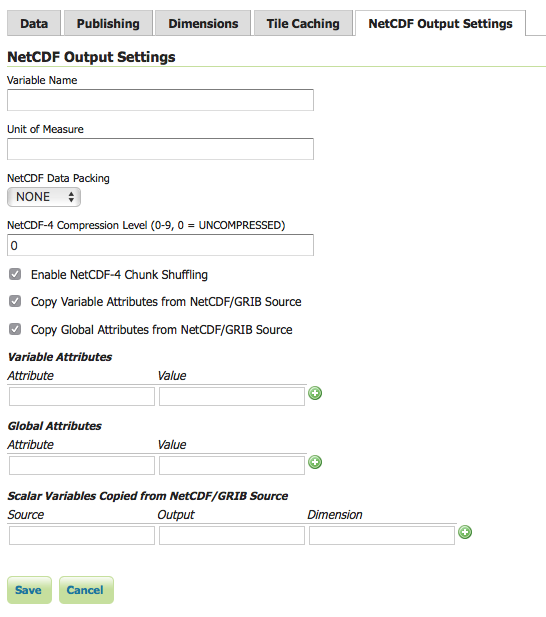 NetCDF output settings can be configured for each raster layer. The similar section in the Global Settings page configures the default settings used for newly created raster layers. Sets the NetCDF variable name. Does not change the layer name, which can be configured in the Data tab. Sets the NetCDF uom attribute. Lossy compression by storing data in reduced precision. One of NONE, BYTE, SHORT, or INT. Level is an integer from 0 (no compression, fastest) to 9 (most compression, slowest). Lossless byte reordering to improve compression. Most attributes are copied from the source NetCDF/GRIB variable. Some attributes such as coordinates and missing_value are skipped as these may no longer be valid. For an ImageMosaic, one granule is chosen as the source. Attributes are copied from the source NetCDF/GRIB global attributes. Values are encoded as integers or doubles if possible, otherwise strings. Values set here overwrite attributes set elsewhere, such as those copied from a source NetCDF/GRIB variable. Source specifies the name of the source variable in a NetCDF file or the toolsUI view of a GRIB file; only scalar source variables are supported. Output specifies the name of the variable in the output NetCDF file. If only one of Source or Output is given, the other is taken as the same. Dimension is either blank to simply copy the source scalar from one granule, or the name of one output NetCDF dimension to cause values to be copied from multiple granules (such as those from an ImageMosaic over a non-spatial dimension) into a one-dimensional variable. The example above copies a single value from multiple reftime scalars into forecast_reference_time dimensioned by time in an ImageMosaic over time. For an ImageMosaic, one granule is chosen as the source for variable attributes. 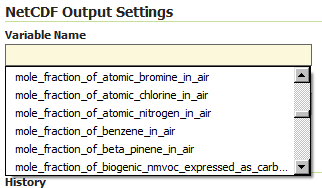 Note that the output name can also be chosen from the list of CF Standard names. Check CF standard names page for more info on it. Once you click on the dropdown, you may choose from the set of available standard names. Note that once you specify the standard name, the unit will be automatically configured, using the canonical unit associated with that standard name. You have three ways to provide it to GeoServer. Add a -DNETCDF_STANDARD_TABLE=/path/to/the/table/tablename.xml property to the startup script. Put that xml file within the GEOSERVER_DATA_DIR. Note that for the 2nd and 3rd case, file name must be cf-standard-name-table.xml.